An Important retrospective of the extraordinary & versatile work of Canadian artist Irwin 'Bud' Crosthwait. Leading fashion illustrator & powerful moderist painter. A unique selling exhibition of work not seen for 50 years. 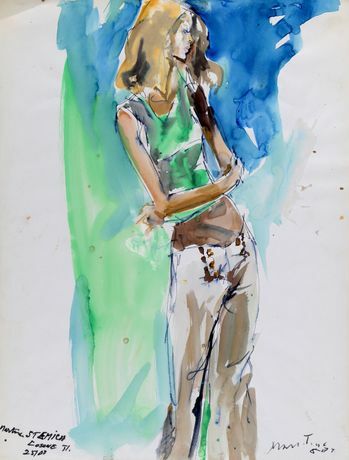 GRAY M.C.A leading specialists in Fashion Illustration and Modern Art are holding a selling exhibition of the work of respected Canadian War Artist, Fashion Illustrator & Modern Painter Irwin ‘Bud’ Crosthwait (1914 – 1981) at Gallery 8, St, James's London. 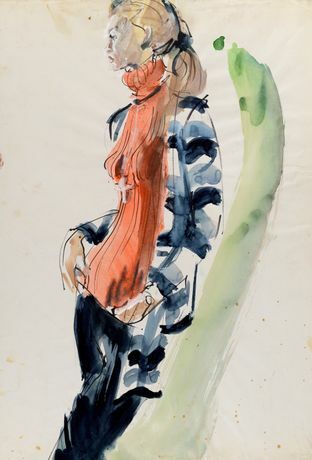 With more than 60 original works from private collections around the world including: War Art, Fashion Illustration & Modern Art with prices ranging from £350 to £10,000. Coinciding with London Fashion Week (SS16), the exhibition will highlight Crosthwait’s work as one of Paris’s acclaimed Fashion Illustrators, commissioned by publications including Harpers Bazaar, Vogue, Elle, Jardin Des Modes, Herald Tribune, New York Times & Femina and designers Givenchy, Dior, Marc Vaughan, Pucci, Courrèges & Yves St Laurent. Crosthwait’s success as a leading fashion illustrator fed his real passion for painting, enabling him to purchase the tools to create his powerful and highly textured Modernist work. Revered by his post war Tachism school abstract expressionist contemporaries, including Victor Vasarely; he exhibited worldwide to great acclaim, alongside Serge Poliakoff, Hans Hartung and Nicholas de Stael.